Billed as the 'Mother of all Derbies', witnessing the Revierderby in the flesh is an experience you are likely to never forget. Coal versus steel, Royal Blue against Black-and-Yellow - underpinned by a long-standing game of oneupmanship for good measure: FC Schalke 04 against Borussia Dortmund is a fixture like no other in world football and last season, bundesliga.com travelled to Gelsenkirchen to witness the magic. Travelling via rail may not be the most glamorous option to get to Gelsenkirchen, the home of Schalke, or Dortmund, but only by traversing the heavily industrialised Ruhr valley can you gain a real insight into German football's fiercest rivalry. A mere 32 kilometres separate Gelsenkirchen and Dortmund, and with several short-distance trains connecting the cities, it is only a matter of time before both sets of fans cross paths on their way to either the SIGNAL IDUNA PARK or, in this case, the VELTINS Arena. Pre-match banter is the norm in a vocal ding-dong that dates back to the local foes' first meeting in 1925. Hours before kick-off in Gelsenkirchen, an expectant buzz fills the air outside the stadium as fans queue in their thousands to get a taste of the spine-tingling ambiance. A sea of blue-and-white interspersed with the odd yellow-and-black Dortmund jersey: it is a scene that is only truly complete with the obligatory Bratwurst and beer combo. 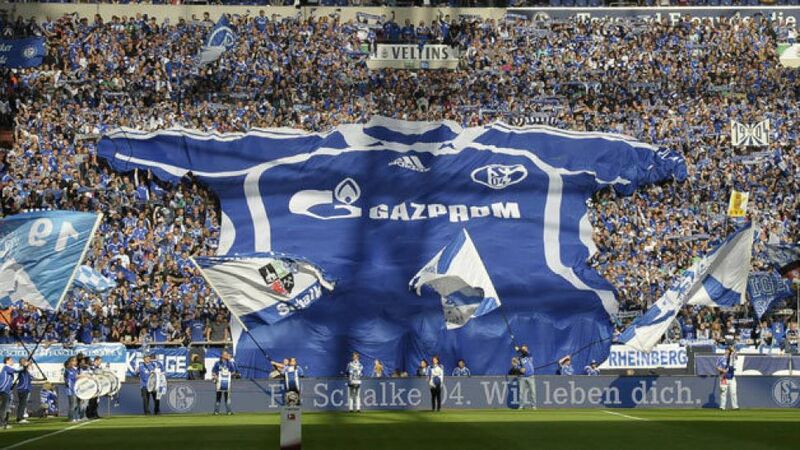 As breathtaking as the atmosphere may be at most Bundesliga matches, the deafening backdrop of the Revierderby truly sets itself apart as one of a kind, reaching its climax at kick-off when followers of both clubs really make their presence felt through chanting, hoisting huge banners into the sky or performing elaborate choreographies. With the atmosphere adding to the electric nature of the encounter, it is only natural that the occasion should get to the players, with the Ruhrpott rumble traditionally being a heated affair to say the least. Ultimately, though, it is bragging rights that matter most come the final whistle at the end of an experience that football fans around the world should be putting on their bucket lists.